Does your neck ache after gazing down at your mobile device for a long time? Do your thumbs get sore after firing off a string of emails on your smartphone? Those are just a two of the physical ailments caused in part by technology. Sporting such names as "text neck," "computer vision syndrome," "Blackberry thumb," and "iPad elbow," these syndromes may sound phony, but they're every bit as real -- and painful -- as carpal tunnel. Here's a look at four increasingly common ailments associated with improper or overuse of gadgets, plus recommendations for how to avoid the problems. Text neck is usually caused by excessive use of smartphones or tablets. Due to the popularity of text messaging with teenagers, the condition is more common in adolescents and young adults, but can be seen in anyone who spends hours looking down at mobile devices. Think of your head as a bowling ball sitting on a spring. Tilting the ball forward for an extended period of time stresses and bends the spring, says Robert Hayden, an Atlanta chiropractor. The more this happens, he says, the greater the chance of flattening the natural curvature of the neck vertebrae. Eventually, you put added pressure on the discs of the cervical spine and more strain on the muscles and ligaments of the neck. You can prevent text neck by taking frequent breaks and using range of motion exercises. Try flexing your neck by looking side to side and putting your ears down against your shoulders, Hayden says. You also can simply try holding your device higher so you're not angling your head down to see it. If the problem persists, ultrasound and electrotherapy can alleviate pain. Long-term remedies include resistance exercises to rebalance the muscles. Overhead fluorescent lighting, the viewing angle of the display, and small font size can contribute to the eye pain and strain of computer vision syndrome, according to Dr. Jim Sheedy, an optometrist and director of Pacific University's Vision Performance Institute in Forest Grove, Ore. Undiagnosed, common eye problems like presbyopia -- a reduced ability to focus on objects that are near -- can exacerbate the condition. Solution: Keep your eyes in shape. Resolving the problem involves a two-prong approach: making the task less visually demanding and taking visual breaks, Sheedy says. For example, turning off the overhead light and using softer desk and floor lamps can help. Also, try making the top of the display level with your eyes so you're looking down about 10 degrees when viewing it. Adjust font sizes so you can read them easily. To keep your eyes in shape, Sheedy recommends the 20/20/20 rule: Every 20 minutes, look away to a distance of at least 20 feet for at least 20 seconds. Such frequent breaks can help because computer vision syndrome is a fatigue problem, not an injury, Sheedy says. 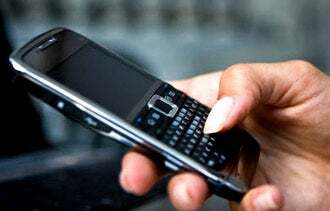 Caused primarily by excessive texting, BlackBerry thumb is a strain of either the tendon that extends the thumb or the tendon that brings the thumb into the palm. The strain causes tiny tears to connective tissue. The severity of the condition depends on how long, how fast and how hard you use a handheld device. But it doesn't affect only those using mobile keyboards -- it can result from any repeated finger motion. "What happens when people don't rest is they go into chronic phase because there's so much scarring and trauma," says Dorit Aaron, president of the American Society of Hand Therapists and an occupational therapist at Houston Hand Therapy in Texas. That means the pain might never go away. Solution: Give your fingers a rest. If you're writing lots of emails on your phone or tablet, take breaks and slow down, Aaron says. Fast texters are more vulnerable because they have more repetitive motions. You also can switch to a touch screen, which may be better than a physical keyboard because it requires minimal pressure. A repetitive strain injury, iPad elbow can affect a variety of tendons from the wrist to the elbow, depending on how you hold your tablet. "People who are using laptops and tablets often don't focus on the ergonomics of it," says Christopher Morris, a Kingsport, Tenn., rheumatologist. Many tablet users curl up on a couch to get more comfortable, he says, rather than paying attention to proper posture. Solution: Try an iPad holder. While orthopedists are still getting a handle on this particular condition, taking breaks can help reduce the pain. "The biggest thing with any kind of repetitive activity is to listen to your body," Morris says. "If doing something for an hour straight is going to make it hurt, don't do it for an hour straight." You also can try one of the many iPad holders. For instance, PropUp ($29.99) allows users to more easily grip and tip the tablet, while GorillaMobile's Ori case ($69.95) props up an iPad in a variety of positions that can make using it easier on the neck, eyes and arms.